Our new exhibition “The Story of Skindles” is now open and will run until October 1st 2016. 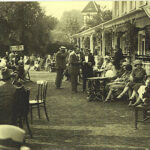 The exhibition covers the whole history of Skindles from the 18th century to its final closure in 1995, but will concentrate on the glory years of the late Victorian and Edwardian eras and the ‘swinging Skindles’ of the 1970’s, when Louis Brown owned the hotel and its nightclub La Valbonne (below right). Memories of a misspent youth for some of our visitors, perhaps! On display are a large stained glass window salvaged from the ruins of Skindles as well as menus, china and crockery and other memorabilia. If anybody reading this new item has any Skindles items which they would be willing to loan, we would be pleased to hear from them. “The Story of Skindles” has been sponsored by Braxtons, who are the selling agents for the homes being built on the Skindles site by Berkeley Homes.